The University District Community Development Association (UDCDA) has been awarded a $300,000 Buffalo Main Streets Initiative (BMSI) grant to help in the revitalization of Bailey Avenue. 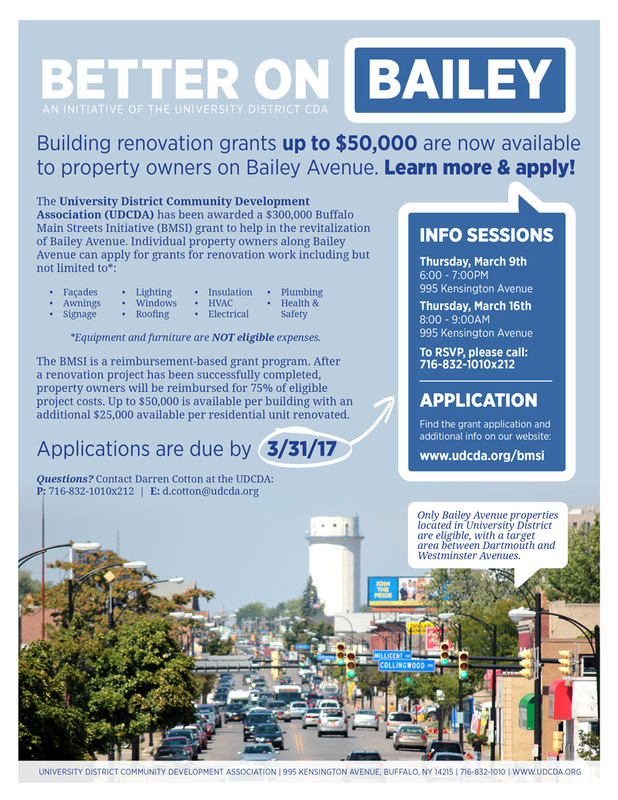 With this funding, the UDCDA has launched the Better on Bailey initiative. The BMSI is a reimbursement program, meaning all project costs must be paid upfront by the property owner. After the renovation project has been completed to the outlined specifications and after supplying appropriate receipts and proof of payment, property owners will be reimbursed for 75% of project costs by the state. This means if a property owner undertakes a renovation project that costs $20,000, once complete, the owner would be eligible for a reimbursement of $15,000. Up to $50,000 is available per building with an additional $25,000 available per residential unit renovated. Due to state regulations, such as environmental review and a competitive bidding process, construction on projects would most like not be able to start for 6-12 months (Summer/Fall of 2017). Any property improvement projects identified for your property would need to be long range planned improvements NOT immediate needed property repairs or improvements. For questions, please contact Darren Cotton, Director of Community Development & Planning at 716-832-1010×212. The Application period is NOW OPEN! 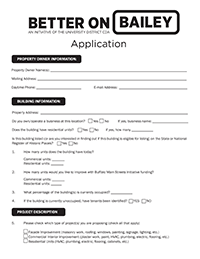 All applications must be completed by the property owner and returned to the UDCDA’s offices located at 995 Kensington Avenue by close of business on Friday, March 31st. 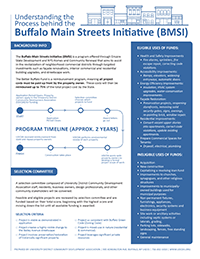 The UDCDA has developed a one page handout to give businesses and property owners a more comprehensive understanding of the Buffalo Main Streets Initiative (BMSI). The handout follows the BMSI process from UDCDA applying for funds, to selecting participating property owners, construction, and reimbursement. 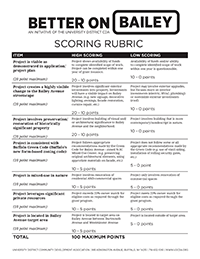 A selection committee composed of UDCDA staff, residents, business owners, design professionals, and other community stakeholders will score applications based on the following scoring rubric. Projects are funded based on their total score, beginning with the highest score and moving down the list until all available funding is awarded.